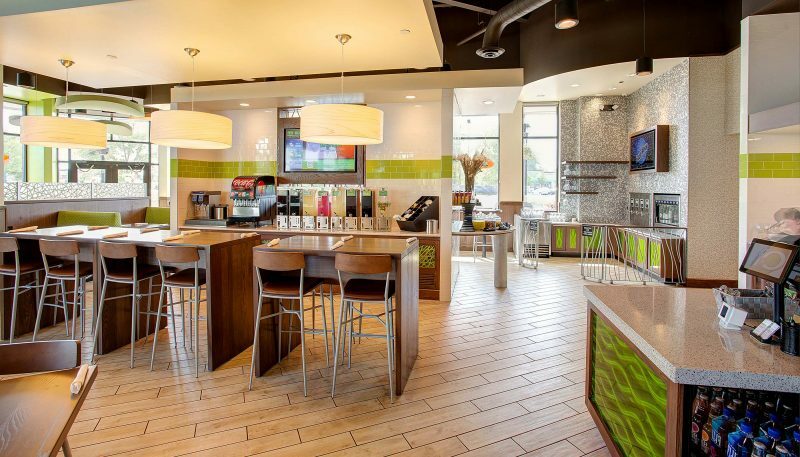 The Fresh To Order restaurant chain boasts super fast made-to-order meals including salads, soups, paninis, long plates, and more. Based in Atlanta, Georgia, serial restaurateur Charles Hensley opened Fresh to Order’s first Indiana location in Fishers this past spring. 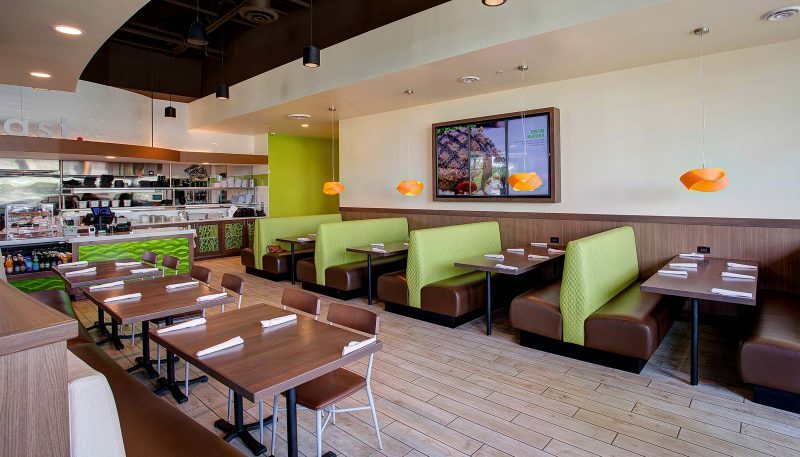 He partnered with us from the get-go to transform an existing space into a perfect fit for the new restaurant. At Curran, working with a brand new client is always fun and exciting. 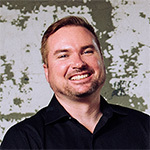 We get to learn the ins and outs of a client’s goals and desires, along with providing creative solutions to fit their unique needs. For example, we helped design a self-service beer and wine dispensing station for Fresh to Order. Similar to ordering a soft drink in a casual restaurant, drink orders are placed at the counter, but customers are given a beverage card to use at a high tech craft beer and wine dispenser. We had never seen anything like this in the casual dining space, and it was fun to bring to life. The building formerly housed Paradise Bakery, which we previously designed. The cafe had since closed and had completely been gutted except for restrooms and small bits of the kitchen. While the previous cafe and Fresh To Order had some similar needs—kitchen, counter ordering, tables, and chairs—the two spaces were also vastly different. Our team was challenged to work within tight space constraints to design a compact yet functional kitchen with areas for a counter, food prep, and cleanup to augment workflow and avoid busy cooks from stepping on each other. Similarly, the dining room needed to accommodate maximum seating without feeling cramped, and allow an intuitive traffic flow for employees and customers. 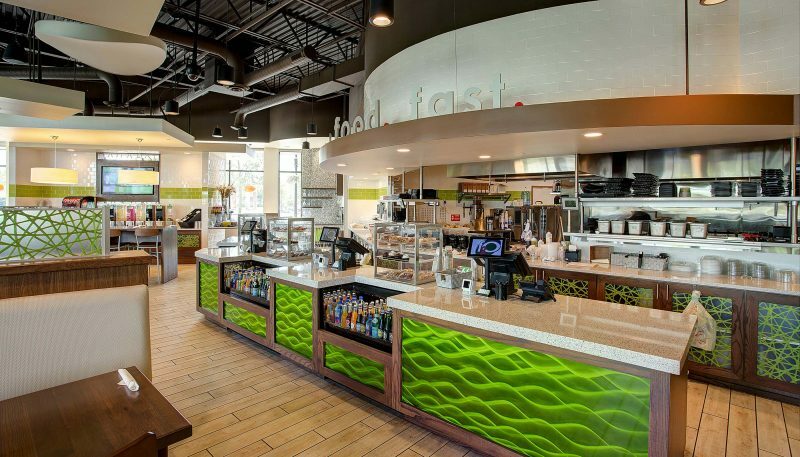 The design was inspired by Fresh To Order’s desire to provide healthy, made-from-scratch meals in a convenient setting. The well-lit space breathes freshness with light grays and tans, exuding a lively, airy feel. 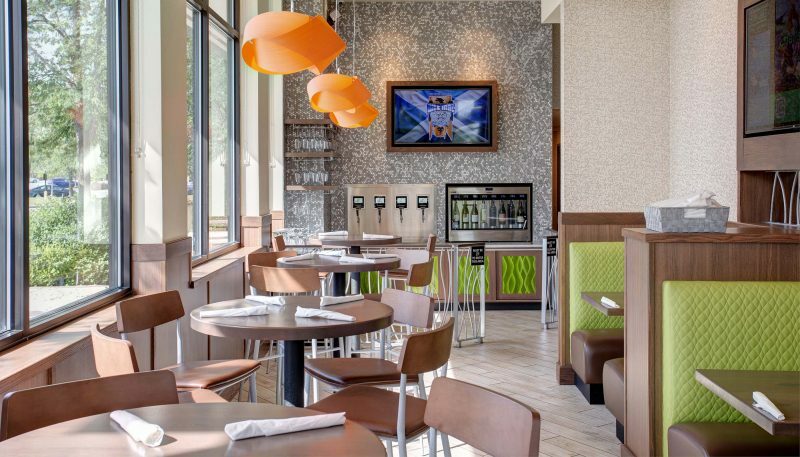 The use of earthy woods evokes a natural ambience for patrons and employees alike. Space constraints are always an issue when you’re dealing with existing construction and expanding is not an option. The goal is to maximize the space without sacrificing design or function. Although the building housed a previous tenant, Fresh To Order feels like a brand new space.